Wednesday, June 1, 2011 at 10:31 a.m.
New Jersey political observers are aware that Governor Christie’s job rating has taken a tumble in the past month. All three pollsters who regularly track his “job approval” found similar declines in public opinion. One common theme in these poll results is that the governor is experiencing a gender gap. Specifically, a majority of men tend to approve of the job he is doing while a majority of women disapprove. This finding is true in all three polls. This is considered especially newsworthy because the issue of funding for family planning services (which the governor vetoed last year) is again on the state’s policy agenda. Observers wonder whether that issue has, or will, hurt the governor given the divergence in public opinion by gender. I tend to be cautious when reading anything more than partisanship into most gender gap results. We live in a highly charged partisan world. Except for rare occasions, Democratic-leaning voters love Democratic officeholders and hate Republican ones, while GOP voters feel just the opposite. Women are more likely to think of themselves as Democrats rather than Republicans on political issues. In most polls that I’ve reviewed, both state and national, about 60 to 65 percent of self-identifying Democrats are women while just under half of Republicans and independents are women. Given this skew, the gender gap in a politician’s rating is often masking general partisan preferences. There will always be some sort of gender gap as a baseline for any partisan politician. 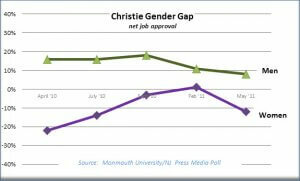 Indeed, recent polls are not the first time New Jersey’s governor has experienced a gender gap in his own ratings. 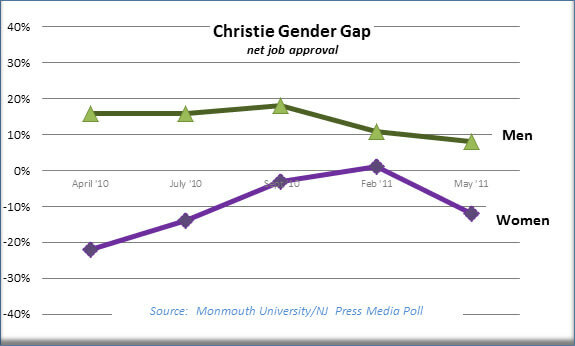 The issue for Chris Christie is whether this gender gap is moving and in what direction. Examining the last five Monmouth University/NJ Press Media Polls, going back to April 2010, we found the governor started off his administration with a fairly wide gender gap. He had a net +16 job rating from men but a -22 rating from women. This poll was taken shortly after he unveiled his initial budget. This gap started to narrow throughout the ensuing year. Christie’s net rating among men remained fairly stable at first before dipping earlier this year, going from +16 in July 2010 and +18 in September 2010 to +10 in February 2011. On the other hand, his standing among women steadily improved to -14 in July, -3 in September, and +1 in February. All that changed with our May poll. While the governor’s net rating among men decreased just slightly to +8, it dropped considerably among women to -12. That indicates a growth in the governor’s gender gap not only among Democratic women, but among independent women as well – a key swing bloc in New Jersey’s electorate. So how does the family planning issue figure into all this? It’s difficult to say definitively, but the current state of public opinion suggests that other issues are on the minds of Garden State women than social issues per se. First of all, Christie’s gender gap was already closing and continued to close after he vetoed the family planning funds last year and participated in a Right to Life rally on the State House steps earlier this year. So, it’s unlikely that his current drop in public opinion among women has much to do with those specific issues. Furthermore, hot button social issues tend to be important in gubernatorial elections only for challengers or when there is an open seat. Incumbents get judged by the job they do on state-specific issues. As such, I think the most likely cause of Christie’s widening gender gap are pocketbook issues related to education and social services. Back in February 2011, in the first weeks of the governor’s term, we asked New Jerseyans how upset they would be with Christie if a number of things happened or did not happen on his watch. For items such as “property taxes remain high” and “the amount of political corruption has not changed,” there was no gender gap. Nearly identical numbers of men and women said they would be very upset if Christie did not address these issues. Interestingly, that’s exactly what Governor Christie did in his initial budget. And the predicted public reaction to those large cuts in education and social services was reflected in the large gender gap in his job approval right after that budget was announced. However, women started to warm to the governor as he settled into office. That is, until his second budget was unveiled earlier this year. While the new budget does not exact more cuts on schools, it does not restore the funding slashed last year. And to make matters worse, the pain of the cuts has not been offset by promised property tax relief. So, while a veto of family planning funds may have some leverage for Democrats among women voters, it’s not necessarily because it is a “female issue.” It is simply part of an overall perception among Garden State women that education and programs for the needy have been cut too much with little to show in the way of benefits to the state as a whole. It’s a perception that Governor Christie will have to work to change as he looks toward reelection in 2013. Another possible factor is Christie's continued atttacks on public employees, especially teachers. For several generations, women received more opportunities in public employment than in the private sector, and a very large portion (I believe 70%) of teachers are women. Thus, Christie's war on public employees and teachers is also an attack on middle class working women. Add to this that women tend to be more involved in their children's schooling and a higher proportion of women are low income, and women's attitudes towards women are understandable. There is a real problem with the news media letting Christie get away with framing his attack on public employees as justified by them being a major cause of the NJ budget deficit. It is one cause, but many poor past political decisions have led to it. I wonder what public opinion would be if you polled asking citizens if they agreed with a "major cut in salaries" of teachers and public workers. That is what these families face. As they look at paying the increased costs of med insurance and pension, and not having cost of living increases that are adequate, they have lost what % of their monthly salary?